Prime Rib, otherwise known as a standing rib roast, is so simple to make at home and is a special treat for holiday gatherings. 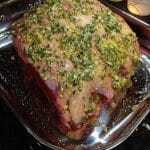 Making a Standing Rib Roast, or otherwise known as prime rib, is a lot easier than you may think. Simply coat with your favorite herbs and seasonings, place in a roasting pan with liquid on the bottom; then wait for a few hours for it to be cooked to your liking. When I was younger (around 18 or so), and started going out to restaurants on dates, prime rib was my go-to meal. We didn’t eat a lot of beef at home, or as a struggling college student for that matter, and I thought it was too difficult to try to make myself. One year for Christmas when I was home from college on break, I decided to make a rib roast for our family dinner. It came out perfectly and everyone loved it! Now, I generally only prepare a Standing Rib Roast for special occasions like Christmas or New Year’s Day as a special treat. Not because it’s difficult, but it can be a little pricey; especially if you’re feeding a crowd! When ordering your roast from the butcher (which is recommended), ask for the first cut as it is generally a better cut of meat and has less fat and is more tender. I personally purchase three ribs; which is equivalent to 6lbs. and serves 6-8 people. When purchasing your roast, figure on three-quarters of a pound per person. 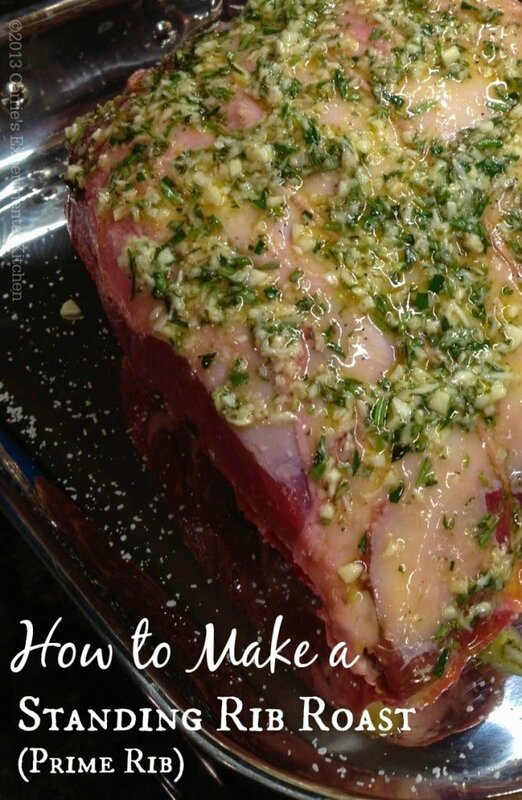 This simple rub recipe below can be used on any cut of beef roast and I really love the flavor combination of garlic, rosemary and horseradish on this standing rib roast the best. Place the roast fat side up in a shallow baking pan; then add some basting liquid to the bottom of the pan. I like to use red wine on the bottom of my pan to give the juices even more of a robust flavor, but water or beef stock will work just as well. When basting, allow the rub to form a crust before basting it with a liquid. By doing so beforehand, you will just wash off the rub prior to it being infused into the meat. Roast the meat for 30 minutes at 450 degrees F; then reduce the oven temperature to 325 degrees F. Continue to cook for an additional 1-2 hours; depending on how you prefer your doneness. Figure on a total of 15 minutes per pound for rare, 20 minutes per pound for medium or 25 minutes per pound for well done. When the roast is done, remove it from the oven and allow to rest for 15 minutes before placing on a cutting board and carving. To carve, begin at the rib top and slice down along the curve of the ribs to separate the meat from the bones; then slice the meat across the grain into the desired thickness. 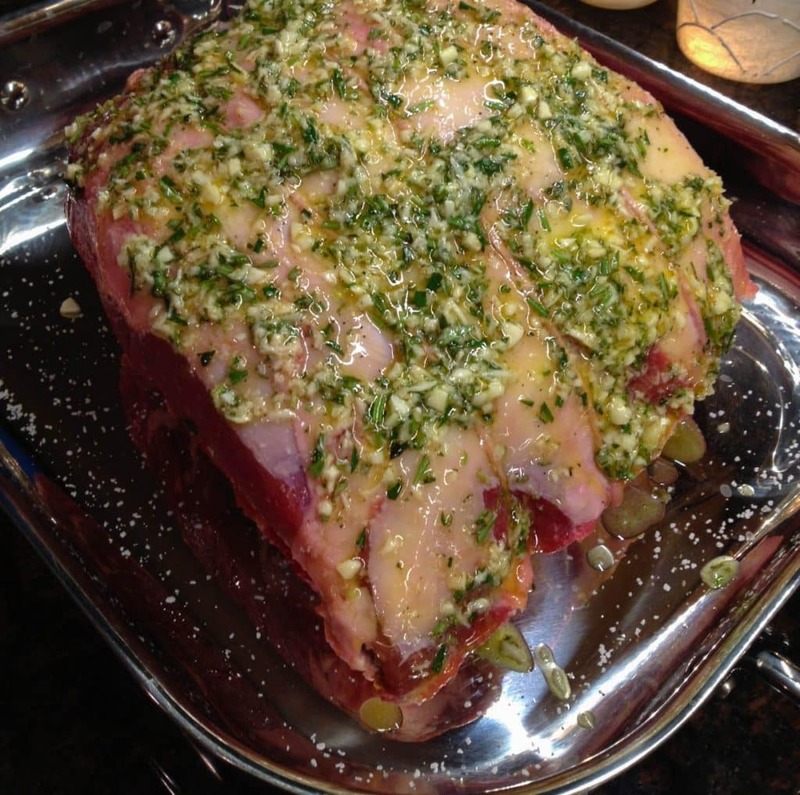 Allow meat to come to room temperature 15 minutes prior to placing it in the oven; then season it with salt and pepper. Combine the garlic, rosemary, horseradish, salt, pepper and oil in a small bowl; then spread it onto the meat. Place the roast rib side down in a shallow roasting pan, and add your "liquid of choice" to the bottom of the pan just enough to cover the bottom (the meat should not be submerged in it). Remove the roast from the oven and allow to rest for 15 minutes before carving. To carve, begin at the rib top and slice down along the curve of the ribs to separate the meat from the bones; then carve meat into 1/4" thick slices. This looks awesome! I haven’t had the occasion to make one of these in a few years but I love your recipe! I always make too much food too…maybe this is my next Sunday dinner. I don’t make it often and I don’t know why. It’s so good. I guess I just have to have company more often on the weekends. Enjoy it and thanks for stopping by Jessica. This looks amazing and just in time. I am having Prime Rib for Christmas Dinner and I love your rub. I also have to prepare an Eye of the Round for the ones who don’t want to see any fat in their meet, and the same rub will be perfect. Thank you for sharing your recipe!! Happy Holidays! You’re welcome and this rub is perfect on any meat. Merry Christmas! I’m trying your recipe tonight. It looks really good. Thank you Rhonda, I hope you enjoyed the recipe!